JK’s govt got you depressed? JK can help! What is JK’s advice to people with depression? Learn how to fly a plane, you’ll feel so much better (natural highs). Or take a holiday in Hawaii, that usually works. JK is a true hero. He is a modest guy who achieved outstanding things during and more importantly after a brilliant rugby career. His struggle with depression and his campaign to help sufferers places him high on the pedestal of people who selflesly help others. 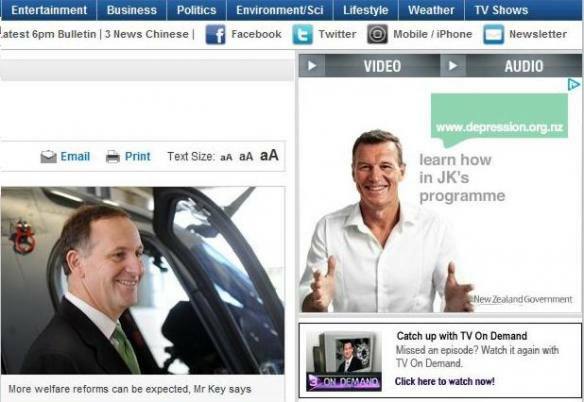 John Key by comparison WYSIWYG…nothing. I think that the steep increase in anxiety and depression disorders of late capitalism has to do with the extreme individualism of the times. Everyone is expected to make their own way, but human beings aren’t made to live this lifestyle. We’re collective-minded beings who have been sold an individualist ethic, based on individual economic responsibility. But that isn’t fulfilling for most people. The power elite however thrive on it, because they have suppressed their need for collective activity/belonging, and focused instead on getting their feeling of security from acquiring ever more money, objects and power. That is a hollow kind of security that can never be quenched, but it keeps them going because with each “achievement” they feel a little buzz, and it’s that buzz that they live for. Of course their valuing of economic and social status makes them feel relatively better than others as well, which is another kind of hollow security. Your loss is their gain. We need to find a way to make society run on social relationships that create a feeling of belonging and security (all humans need to feel this in order to be happy), whilst ensuring economic and environmental sustainability. This is a huge task, but it has to happen some way. This market madness can only end in absolute disaster. You have hit the nail on the head with an absolute truth. It was certainly “sold” to us by some very cunning, unscrupulous, people over the last thirty odd years. We now know this to be true too. BBC4 series THE CENTURY OF THE SELF. Very interesting tc. I have never been all that impressed with analysis – how self-centred! Thats why countries with less disparity of income are happier. Denmark is the worlds happiest country.90% of people in poverty are depressed.so getting rid of poverty would help New Zealand in lots of areas like suicide rates child poverty. These problems are not new to New Zealand its time we as a nation did everything possible to make our communities a better all round places to live and work. Work we must have more work skills and bigger effort to help get more people into decent work places where people can flourish,its a good anti depressant. Fun and activity another good antidepressant family and community activity community cohesiveness.The Govt should be working a lot harder in these areas .Getting local govt and community organizations to help.While we are stuck on this individual responsibility garbage it has just excused us to be selfish consumerists and we have neglected and abandoned our community! Thanks seeker – nice quote too. A leonard cohen quote that seems to pop to mind – “the spirit of the world has crossed the threshold, and it’s over-turned the order of the soul”. There’s no longer any emphasis on the idea of universal/transcendental love that you can find in the teachings of Buddhism, Hinduism and Christianity either. It’s the age of the ego, and it has gone a long way toward destroying the spiritual/social connecting fabric that ultimately makes people feel part of something worth while. I believe that we will see a return of this when the expletive hits the fan economically however. More and more people will start to rediscover the joy of shared life. We will have to.